Water levels on the River Moy have dropped further during the week. Angling conditions in the upper and middle sections of the river remained favourable with a number of nice spring salmon caught. The Ballina Salmon Anglers' stretch also enjoyed reasonable fishing with Mark Beattie landing an elven pounder on worm. 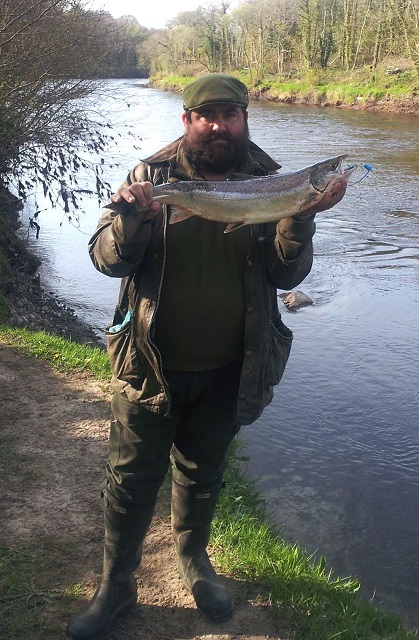 Newly appointed Coolcronan Fishery Manager, Garry Keaveney, had the first salmon of the season on the Coolcronan water. Garry's fish weighed 7 lbs. and took a worm. 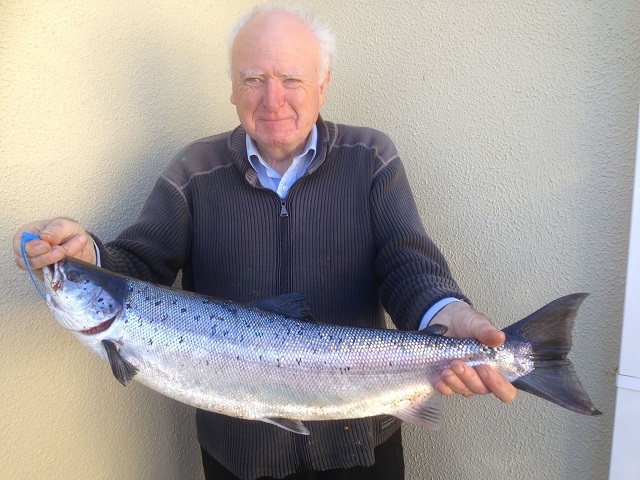 Further upriver fishing the Foxford area, Vincent Duigan caught a 10 lbs. fish also on worm, while East Mayo produced a number of good springers as well. Amongst the successful anglers were Reto Coutalides, Switzerland, with a fine 11.5 lbs. fly-caught salmon, Brendan Wilson with an 8.5 lbs fish also on fly and Fabian Hintermeyer, France, with a nine pounder on spinner. Vincent Duigan with his fine ten pounder! Despite the cold and gusty northerly winds which prevailed for most of the week, anglers on Carrowmore Lake still enjoyed good spring salmon fishing. A total of 21 salmon were reported by anglers of which over 50% were released. Thirteen year old Tom Bell will definitely remember his day on Carrowmore Lake as he caught his first ever salmon on fly! John Campbell had the best fish of the week, a fine 10 lbs salmon which he released, while Shane Maloney's, first visit to Carrowmore Lake also resulted in a fine springer. Other successful anglers included R.Mayock, P.O'Mara, J. O'Neill & C.Blake. It was a difficult week with cold northerly winds for anglers on Lough Arrow. Only sheltered bays saw sporadic hatches of duckfly and some olives. Nevertheless, the few anglers who were brave enough to venture out reported good catches. Paul Casey, P.J. O'Hara and James Clancy all had fish between 1.25 lbs. and 1.75 lbs. Ken Murray & Gerry Kelly boated a total of 6 fish (5 released) on Saturday, all between 1 lbs. and 2 lbs. All fish were caught on wet flies.